Preview allows users to view the exact document that KO PUNCHLIST will export. On the top border of Preview there are options to include or exclude Images, PDFs and Legend. Projects can also be exported with active filters. For further help with applying filters, review how to sort or filter a punchlist. PDFs and CSV files can be exported through the “Share” button at the top right corner of the screen. Copying a PDF or CSV file to Vault is the prerequisite step to sharing through any of the compatible Online Storage Utilities. To prepare a “.punchlist” file that can later be shared among other KO PUNCHLIST users, go to the Home Screen, Open Project, and tap the “Archive” button corresponding to the punchlist project you wish to export. Once the file is archived and available in the App Vault it can then be transferred to any of the compatible Online Storage Utilities. To merge projects, go to Open Project and tap the “Merge” button next to the first project you would like to select for merging. You will then be prompted to select the second project to merge. Note that you can only merge two projects at a time. To merge more than two projects repeat the process as many times as necessary. If two projects have a different assembly of columns, all columns will be imported into one file. Hiding columns does not prevent them from being omitted in merging or sharing. The best way to transfer large files is through iTunes. Transfering files through a USB connection does not require internet connectivity and is therefore the most secure way to ensure that large files (such as 100MB reference documents or heavily populated “.PUNCHLIST” files) transfer without error. For smaller files KO PUNCHLISTS provides the convenience of file transfer through a selection of compatible Online Storage Utility services. Files can be transferred into the App Vault from any of the comaptible Online Storage Utilities, and also directly from the project. The App Vault is a temporary holding place. Review the frequently asked questions about App Vault, also review full list of file types. To transfer files from an Online Storage Utility into the App Vault, go to the KO PUNCHLIST Home Screen and tap on the Vault icon. Along the bottom of the Vault page are options to import from any of the compatible Online Storage Utilities. For additional help review the Online Storage Utility log in instructions. To transfer files from a Project into the App Vault, tap on any cell of any Media Column to open the respective editor. In the top left corner of all of the media editors there is a button to “Copy to Vault”. Copying to Vault does not remove or modify the file within the project or original file location. It creates an independent duplicate of the file in the Vault and makes it available for further transfer and sharing. Files can be transferred out of the App Vault into any of the comaptible Online Storage Utilities, to collegues through email, and also into an open project. The App Vault is a temporary holding place. Review the frequently asked questions about App Vault, also see full list of file types. To transfer a file from the Vault to an Online Storage Utility or share through email, tap the Vault icon on the KO PUNCHLIST Home Screen, select the “Export” button next to the file of your choice and a list of export options will appear. For additional help review the Online Storage Utility log in instructions. To import .jpg, .png or .pdf files from the App Vault into a project, tap a cell under an Image column or Pin column to load the appropriate file. Transfering file out of the Vault does not remove or modify the file within the Vault. It creates an independent duplicate of the file in the new location. To archive or backup a project within the app, go to the Home Screen, Open Project, and tap the “Archive” button next to the desired punchlist. This will save a copy of the punchlist to the App Vault. To reduce any chances of loss of information, users are encouraged to regularly save backups of punchlist projects from the App Vault to storage off of your iPad. For instance save to any of the compatible Online Storage Utilities, or to iTunes at a desktop computer. For further information review how to transfer files out of the App Vault and iTunes connnectivity. What is the 'Package' Setting? The Package export creates a zip folder with all your punchlist project content including: a PDF print, an Excel file, an HTML file, all of the project’s images, PDFs and audio and video files. What is the maximum file size for email? The maximum file size to share a project via email is 15MB. Review Online Storage Utilities for alternate means of sharing punchlist projects. A contact can not be deleted if the initials are in use anywhere in the line items, for instance in columns such as Action By, Cited By and Closed By. All references to contact must be cleared before a contact can be deleted from the project, and any changes made to the contact’s initials will automatically update in the punchlist line items. 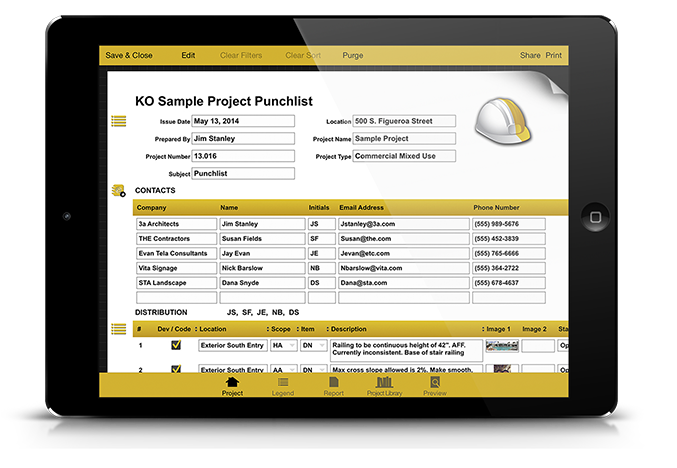 To replace the KO PUNCHLIST hardhat logo with a personalized company logo tap the KO PUNCHLIST hardhat logo in the top right hand corner of the project. A popup appears with options to select an Image Already in the Document, an Image from the App Vault, Import from Photos, Take a Photo or Blank Sketch. The project name can be changed within the Project Editor, however the original file name remains in the “Open Project” page of the home screen. To update the project file name, make a duplicate project with a new name using the “Duplicate” button on the “Open Project” page. Press and hold any data cell in the punchlist for two seconds for Delete Row and Clear Cell options to appear. Deleting a row permanently deletes all information in all the columns of the selected line item. Clear will only delete the information of the single selected cell. The “Edit” button at the top boarder of the project editor allows the user to delete or rearrange line items and contacts. Note that any abbreviations or contact initials that are referenced in at least one line item can not be deleted from the project until all of the references and associations are removed from the punchlist. To re-arrange contacts and line items use the grey icons on the right hand side of the page by dragging to reposition the data fields. At the top center of the project editor there is a button to “Purge”. Purging permanently deletes all unused media in the open project only. This is a good way to clean up the Project Library. As long as a media file is associated with at least one line item it can not be deleted from the Project Library. Scope and Item Codes can be added or deleted in the Project Legend. Any scope or item code in use by at least one line item in the project can not be deleted from the Project Legend until its refrences have been removed from the line items. Changes to abbreviation codes made in the Project Legend will automatically update in the punchlist line items. All columns except for Images can be sorted and filtered, the best way to sort through your images is through Project Library. Each column has its own options particular to the data in the fields. Tap once on the name of any column to view the applicable options. While Sort or Filter mode is on a color indicator appears at the top of the column. There is no limit to the number of Sort and Filter settings applied simultaneously. To clear the Sorting or Filtering on a single column tap on the column name again and hit Clear. To reset all the active Sort and Filter functions in the entire project use the “Clear Filters” and “Clear Sort” buttons at the top border of the project viewer. On the top of the Preview screen there is an option to turn filters off and on prior to sharing a punchlist. Users can hide or add subjects or colums at any time by tapping the yellow icon on the left hand side and checking or unchecking the available column headings. Hiding does not delete data and data will export with the rest of the project when the punchlist file is shared. Passwords can be added at the time a new project is created or when an existing project is duplicated. A passwords will not encrypt the KO PUNCHLIST file. Users are encouraged to use the passlock on their iPads for added security and only share work with trusted collegues. The only way to remove a password lock from the project is to first type in the password and then tap the “Remove Password” button. For further information about KO PUNCHLIST security, please review our Terms and Conditions. Image quality is controlled through the Settings on the KO PUNCHLIST Home Screen. Image quality can by modified anytime. Increasing the image quality will increase the amount of memory a punchlist project uses on your iPad. For larger projects a lower image quality is recommended. If image quality is modified midway through a punchlist project the quality of the earlier images will not be altered. The setting only affects images to be imported after the change is made. Access to any of the Online Storage Utilities is established through Settings on the KO PUNCHLIST Home Screen. Tap “Login” next to any of the available utilities you wish to connect to. These utilities include: Box.net, Dropbox, Google Drive, SkyDrive, SugarSync and FTP. Each service has its own Application Programming Interface (or API) that will walk you through the steps of logging in. Internet access is required to login, view, import to, or export from your online folders.